- USES perfect for the bedroom , hallway lounge dining in fact anywhere in your home or office. 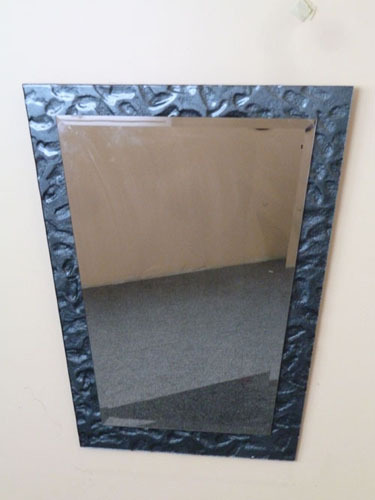 - SIZE 88 cm high and 72cm wide mirror weighing about 14.kilo. - ORIENTATION this mirror can be either hung vertically or horizontally. - COLOUR Grey slumped glass . - ORIGIN The frame was design and manufactured in Sydney By Slumped Glass Co. and the mirror purchased from pilkington and assembled here in sydney, using double coated mirrors from Pilkington. - DELIVERY Pick up would be prefered but Can be delivered and or sent by courier in the Sydney metro for $35.00 Wollongong $55.00 Central coast $85.00.